I arrived Friday morning, drove straight to the media check-in tent, received my credentials, hopped on a golf cart and before I knew it I was dropped off at show center right up front. I can't say enough about the Marines' hospitality. It had rained Thursday night and Friday morning. Friday the clouds were great for shooting photos. Saturday was a beautiful sunny day in Miramar. I have been attending the Miramar Air Show for many years and I've never been disappointed. New acts this year include the Patriots jet team which consists of six L-39 jets and lots of smoke. The USMC MV-22 Osprey demonstration was also added this year. The Osprey demo was provided by VMM-163 and piloted by Capt. Kaiser and crew. The Osprey is the first production tilt-rotor aircraft. My favorite addition to this years show had to be the USAF F-22 Raptor. This was my first time seeing the Raptor and I was amazed at how maneuverable a jet can be. The F-22 can cruise at supersonic speeds greater than mach 1.5 without using its afterburner. This F-22A Raptor was out of Langley AFB, Virginia, and was piloted by Major Henry 'Schadow' Schantz. After the solo demonstration, the F-22 joined up with Kevin Eldridge in his P-51 Mustang for the USAF Heritage Flight. There were a few new civilian performers this year as well. The rest of the Miramar Air Show consisted of the always impressive MAGTF (Marine Air-Ground Task Force). The MAGTF demonstration included the KC-130J Super Hercules demonstrating its in flight refueling capabilities. The F/A-18 Hornets and the AV-8B Harrier II+ displayed their impressive air support capabilities. The MAGTF also included the CH-46E Sea Knight, the AH-1Z Super Cobra, the CH-53E Super Stallion, and the UH-1Y Huey helicopters. The MV-22 Osprey also demonstrated its ability to act as effectively as a helicopter while also having the the long range, high speed and high altitude capabilities of a twin engine turboprop aircraft. The USN F/A-18E/F Super Hornet demonstration is always one of my favorites and this year it did not disappoint. The single-seat F/A-18E Super Hornet was provided by the VFA-122 "Flying Eagles" out of NAS Lemoore, California and was piloted by Lt Jeff 'Lou' Findley. Also returning this year was the AV-8B Harrier. The Harrier demo was provided by the VMA-513 "Flying Nightmares" piloted by LtCol Samuel Smith (CO VMA-513) based out of USMCAS Yuma, Arizona. Sean Tucker was there as well in his "Oracle Challenger" as always he put on a great aerobatic performance. The final act of the Air Show was the USN Blue Angels. What can I say about the Blue Angels that hasn't already been said? The Blue Angels are based out of Pensacola Florida, and they spend January through March training pilots and new team members at NAS El Centro, California. The Demonstration this year was as exciting as ever. One difference I noticed that instead of the #4 and #5 planes they used two two-seaters with #7 in Friday's show. I always love watching the Blue Angels perform. They always put on a great show. 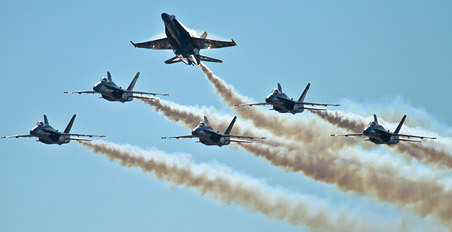 The 2012 Miramar Air Show was as good as ever. I am always a little sad when its over, knowing I have to wait one more year to see it again. The show this year was blessed with great weather and great performances by both military and civilian pilots. I would like to thank the United States Marine Corps for taking such great care of the media and the spectators. I will definitely be back in 2013.